Introduction - Where Am I? Safe to say, 30+ hours of travel combined with time zones has left my body like "what the actual donkey dung are you doing to me? I don't know where I am, what time it is, I need some help here!" Don't you worry body, I'll sort you out with that - we're in Melbourne, Australia baby and it's time to head out and see the sites! Well, the tram network and "myki" (pay as you go travel card for public transport in Melbourne) were things I just winged my way through this morning. I went on a bit of a wild goose chase to try and find a shop that could tell me what was going on but it seems their website isn't up to date with outlets that deal with myki related things. D'oh! However, their website IS good for planning routes once you have topped up your card and that really helped me out! You can plan your route here. 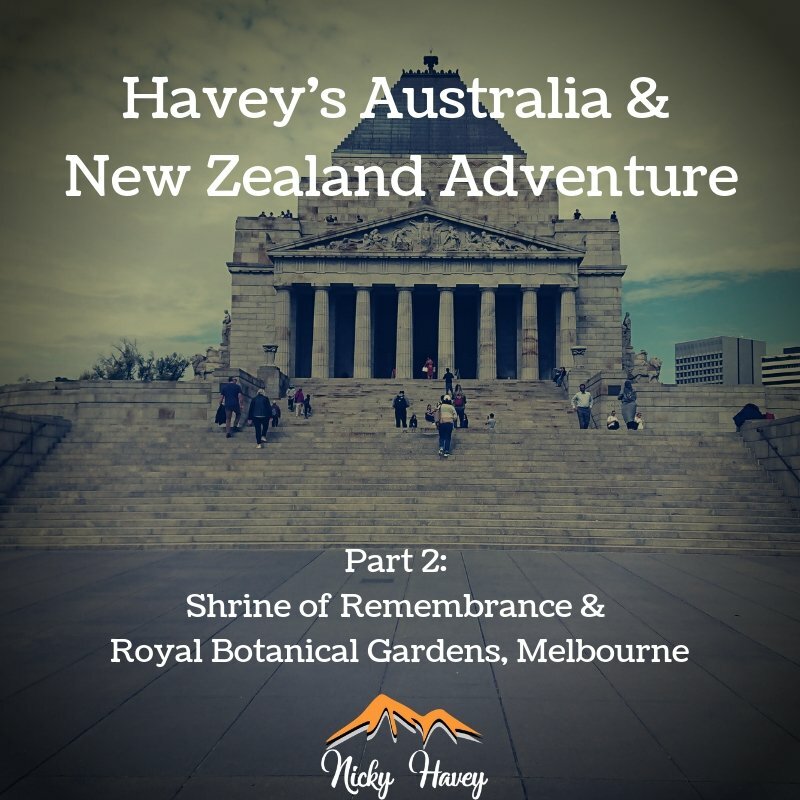 You can either type in the location "Shrine of Remembrance" to the website or if you've "got game", you have a plethora of trams that will take you there - look for "Stop 19" on tram routes 3, 3a, 5, 6, 16, 64, 67 or 72. From Preston, I boarded the the route 86 tram and joined the 3a from there. There is also a "free tram zone" in Melbourne so if you are visiting that area and hop on to the tram, you don't even need to tap your myki card as it's free to travel! Once you get off the tram, walk down the main street (St Kilda Road) and then you really can't miss it as it's up the hill to your left. The Shrine of Remembrance - you can't miss it! Melbourne's iconic landmark and Victoria's war memorial dedicated in 1934. 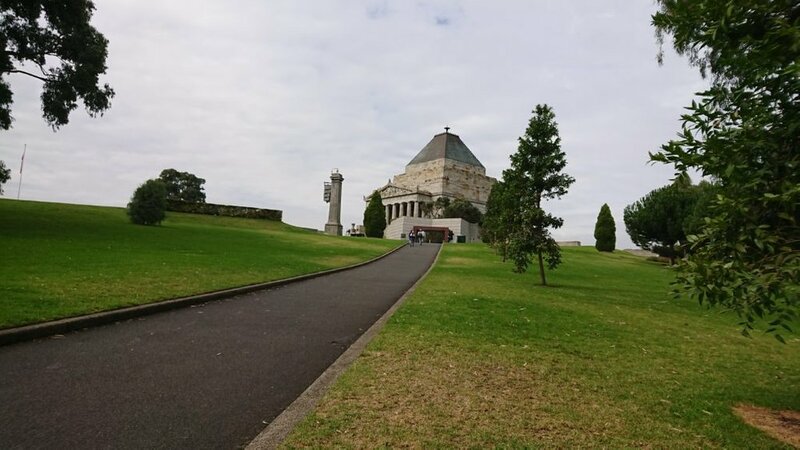 Situated in 13 hectares of beautiful parkland, the Shrine is a place to commemorate and learn about the service and sacrifice of Australian men and women. Includes guided tours, Galleries of Remembrance and special exhibitions. Now, as I have a strong interest in the history of World War I, World War II, the Cold War and beyond, I am always interested to learn about war stories from a different perspective. As Australia was part of the British Empire at the time of WWI & WWII, they would no doubt be involved in the war effort in some capacity. This is the perfect place for me to find out more about this from an Australian point of view, plus the building itself is special, along with some magical views of the city. Walking up the hill to the front of the Shrine allows us see this spectacular staircase with prominent columns at the entrance. "Let all men know that this is holy ground. This shrine, established in the hearts of men as on the solid earth, commemorates a people's fortitude and sacrifice. Ye therefore that come after, give remembrance." "This monument was erected by a grateful people to the honoured memory of the men and women who served the empire in the great war of 1914-1918"
OK, let's head inside shall we? 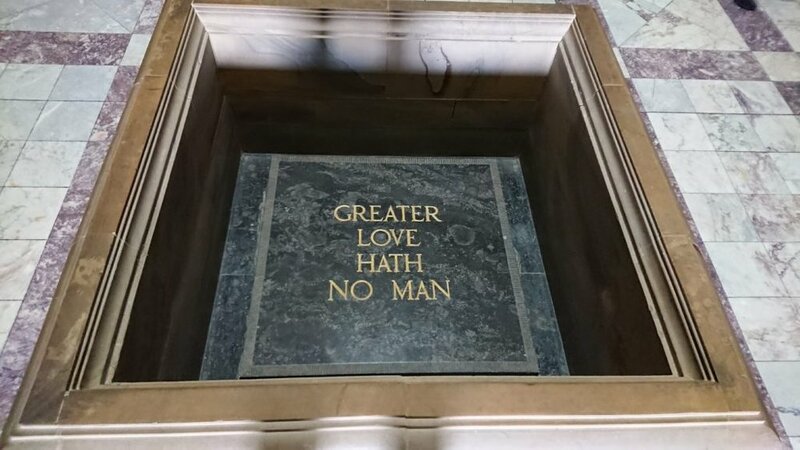 The first big room you'll come to is called the "Sanctuary" which has in its centre, the Stone of Remembrance - a marble stone with the words "Greater love hath no man" carved out of it - and the tall central spire that has a light source at its apex. As I walked in to this room, one of the volunteers, a senior gentlemen who's Dad survived the 4 years he was in the Great War (1914-1918), was just rounding up a tour so I thought I'd listen in. He gathered them around the Stone of Remembrance as every 30 minutes, a light shines and moves across the stone. This artificial light emanating from the top of the spire slowly moves across the stone as the "Last Post" is playing. On Remembrance Sunday itself (11th November every year), the light that shines is natural as the clever use of mirrors focuses it down on to the stone. When your eyes look up from the central stone, you'll notice the 16 tall, dark columns that climb high in to the spire. Alan, the tour guide, was telling me that these are made of sea bed! That's right, the Earth's mantle! He even pointed out a fossilised crab that you can just about make out from millions of years ago! How Did Australia Get Involved In The Wars? I asked this to Alan as I was interested in the propaganda campaign and if it was any different to the UK's approach. Simply put, it was exactly the same - "Fight for King and Country" - and as they were part of the then British Empire, they didn't have a choice! Same with India. Another tour guide I spoke to later on told me that there were two public referendums about whether or not Australia should join World War II but they both answered "Yes". So the Australians joined in the bloodiest battles the world has ever known, despite seemingly being a world away from it. I talked with Alan for a while as I told him I'm a Brit, he told me he's visited a few times and he wanted to take a selfie with me! What a legend! I wasn't expecting that, I RARELY take any selfies, yet, you're about to see two in this blog post! 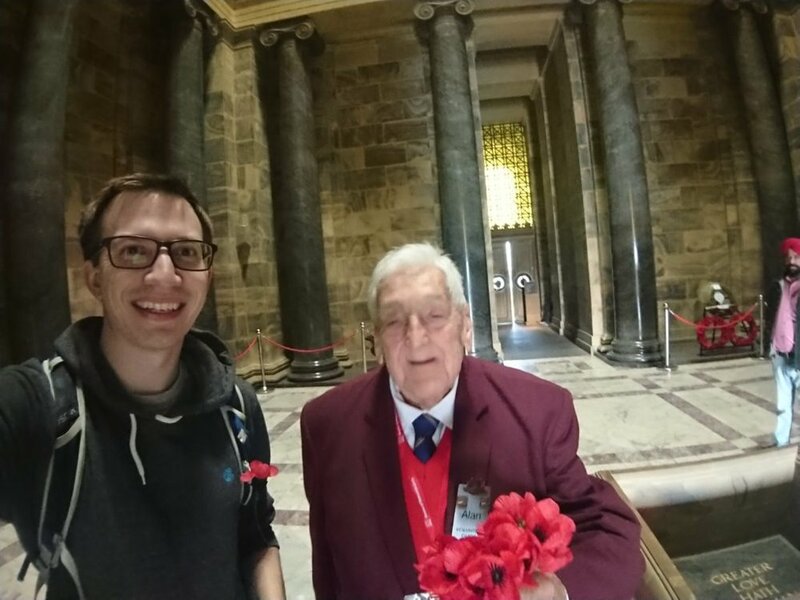 Here's the one with Alan in the sanctuary as he picked up the symbolic poppy flower which is used for remembrance in both our countries. Selfie with Alan the legendary tour guide! Just behind Alan's left shoulder are some doors. Before you get to them, head right then go down the stairs and you will unravel the rich history that Australia has had in various war efforts in a vast area called "The Crypt". I can't share photos of what it's like down here due to the Shrine of Remembrance Act 1978 but if you love reading about history, there's plenty to get stuck in to here! We've already touched upon the World Wars but there's some uncertainty about when exactly the "British Empire" became a "Commonwealth" as it seemed that around this time (after the Second World War), Australia would take its own position as peacekeeper in various conflicts around the world. Some conflicts have been lingering since the 1960s, meaning that the Australian military have been in a dangerous situation not taking sides and making sure agreements are adhered to, even the hostile ones. At this point, my head was beginning to spin but I have a new found respect and understanding of Australia's history and involvement in global conflicts. There is a visitor centre where you can get souvenirs but there was just one more place I wanted to see and those were the views from the top balcony. To get here, you need to make your way back out to the front and then, as soon as you walk in the building (before the sanctuary), you head right towards the stairs (or left if you're a daredevil)! Both flights of stairs have 63 steps in them and you'll soon notice how unfit you are! I know I did! But it was worth it because walking around the top yielded some amazing views. 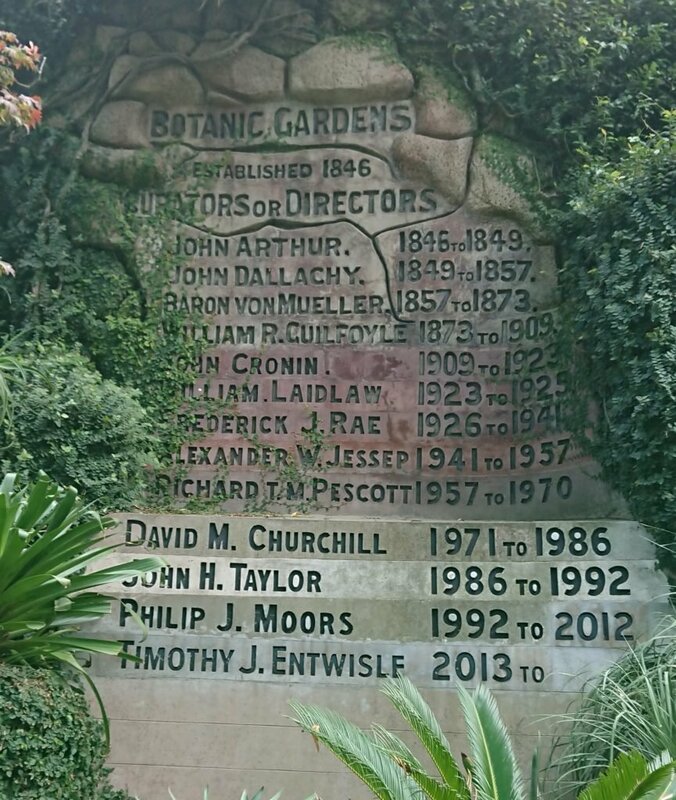 Ah, is that the Royal Botanical Gardens I see across the road? Well, let's have a look at those shall we?! Being a sucker for cold hard efficiency, I felt like killing two birds with one stone seeing as I was "in the neighbourhood" and I achieved the accolade "Mr Efficient" by pottering around the Royal Botanical Gardens for a couple of hours. My goodness, this is huge and bigger than the one's I'd been to before in Sydney (at least from what I remember)! Here's what the official visitor map had to say about it all. Enjoy this calm oasis in the heart of Melbourne. Discover beautiful plants and stunning vistas in one of the world's finest gardens. Learn about Indigenous culture on an Aboriginal Heritage Walk; relax at one of our cafes or take a punt tour on the lake. Free entry. Free entry you say? I'm in. Normally when you read about something portraying itself as the "World's Best ...", do you normally just think, "Well, they can't ALL be the best in the world"? Or is that just me? Haha! But, this has definitely been one of the best ones I've been to in terms of size, how well it's all maintained, the layout, the information and sheer volume of exotic plants from all areas of the globe! I'm going to share some of my picks below from when I was walking around and hope you feel compelled to walk through when you're in Melbourne next! If you're feeling up for a rumble in the jungle you can go for an Australian forest walk! 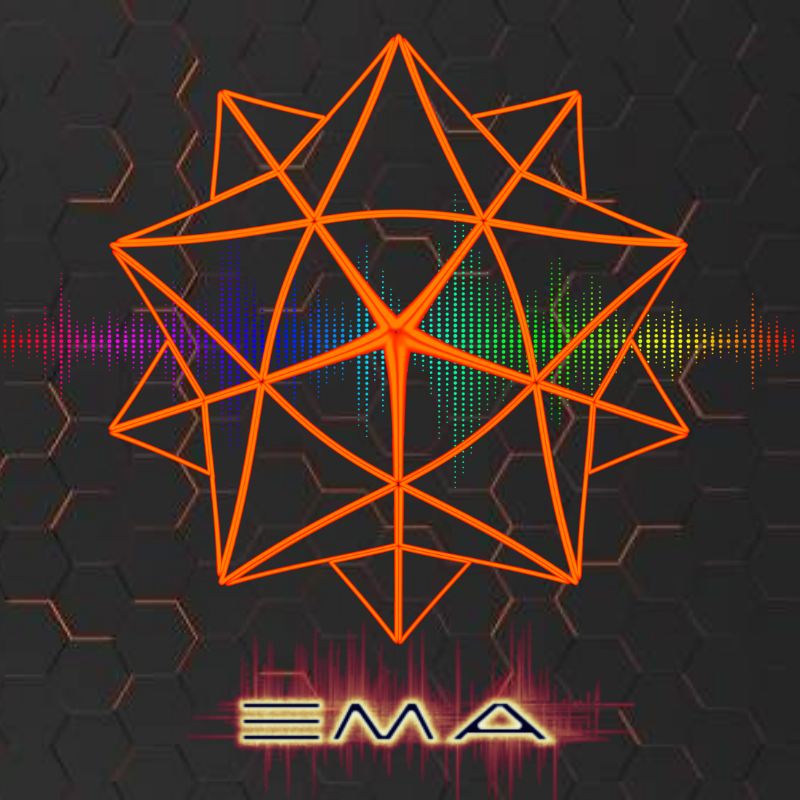 I hope you enjoyed this blog, until the next time - take it easy! Well, whilst I'm here, I might as well take the chance to tell you about a new contest that I've been a part of with the Power House Creatives called @phctop3. All you need to do is tell us what your top 3 favourites for a chance to win from a growing prize pool - more info here.